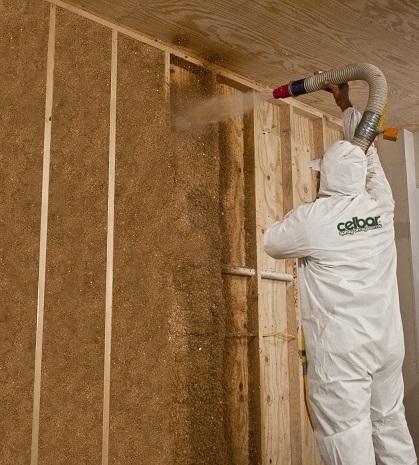 Celbar cavity fill insulation is a blend of recycled specially prepared cellulose fibres, organic in nature and treated to make it fire retardant. Tests have shown that when packed together, this natural cellulose insulation material is acoustically and thermally more effective than man-made mineral wool. Celbar is used as a cavity filler in walls or between floors either in conventional rigid construction or with isolated systems e.g. combined with one of our Oscar Iso-Mounts range for higher soundproofing performance (see Oscar Iso-Mount product page). 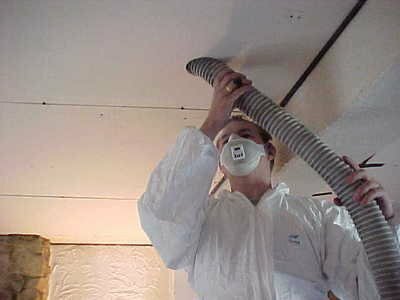 Celbar cavity fill insulation can either be sprayed into the cavity before the void is closed OR where a void is already closed it is blown by a hose through holes to improve the acoustic insulation of walls and/or ceilings. This seals any holes and cracks in the wallboard, around electrical outlets, plumbing and other irregularities so there are no compressed areas or voids to allow sound leaks or air infiltration. When two layers of plasterboard are used, the Celbar cavity fill insulation is blown in before the second layer is fitted. Celbar cavity fill insulation provides superior sound transfer control demanded by designers, owners & occupants. Older properties with ornate ceilings benefit with Celbar cavity fill insulation blown into the ceiling void reducing noise from rooms above. It is blown into the void through small holes cut into flat areas of the ceiling and repaired afterwards or if major refurbishment is taking place it is filled from above by lifting floorboards. For the ultimate soundproofing solution, use in conjunction with one of our Oscar Iso-Mount space saving acoustic hanger range. Thermal performance guide filling floor void space, typical < U = 0.25 W/m2K. Lofts are insulated quickly and efficiently with Celbar cavity insulation. There are no known serious risks to health associated with Celbar recycled acoustic thermal insulation. It is non-carcinogenic and any small release of fibre during installation or subsequent maintenance work is not hazardous or considered a ‘Health and Safety’ risk. Celbar cavity fill insulation is not subject to legislation applicable to mineral or vitrified fibre. As an added bonus, Celbar cavity fill insulation is non-itchy! Naturally safe recycled cellulose fibre. Reconstruction of a building may necessitate removal of Celbar cavity fill insulation fibre. It can be recycled or disposed of as a non-special waste to landfill. Your local authority waste disposal will give advice on recycling. The fibre is organic cellulose derived entirely from recycled macerated paper and treated with a borax compound to protect against fungus, insects and rodents. It also has fire protection built in. Celbar cavity fill insulation has excellent thermal resistance and provides a high degree of thermal insulation. Recycled material and a low manufacturing energy requirement combine to produce probably the most environmentally friendly material used in building construction, low CO2. Incredible!